What kinds of music are you going to hear when you arrive in Spain? ¡Mucho! But just because Enrique Iglesias is from Spain (not Mexico) does not mean that you are listening to real Spanish music. When kids turn on the radio in the United States they might hear Shakira singing her popular song La Tortura (the torture) along with Spanish Grammy winner Alejandro Sanz, but sorry Enrique and Alejandro, Spanish music is and always will be flamenco, de pura sepa (the best of the best). 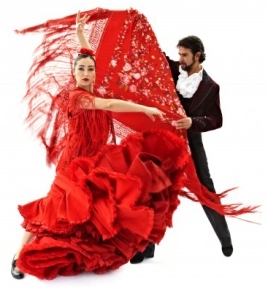 There are at least 30 varieties of flamenco in Spain and can be found everywhere. And since Spain invented the guitar the people know their music. The famous Spanish poet Fredrico Garcia Lorca called flamenco one of the greatest inventions of the Spanish people. During my 2½ years in Spain I heard flamenco more than anything, especially in los barrios gitanos (gypsy neighborhoods). Flamenco can be considered much more than music - rather a lifestyle. With so much diversity in Spain the love of flamenco has been a constant through out and even has roots in France. The beauty of flamenco takes more than just a guitar; the style is tied to the elaborate dancers with castanets and the traditional hand clapping. The type of flamenco most tourists see is with colorful dresses and music dating back to the 16th century from the region of Andalucía with traces of Moorish and Jewish traditions. But flamenco is not just a style from centuries before. El Camarón de la isla (1950-1992) helped bring about nuevo (new) flamenco with the induction of the electric bass. Camarón is considered a legend in Spain with his image everywhere from car stickers to t-shirts. After a battle with lung cancer Camarón died. Over 100,000 mourners at the funeral truly showed the world the power his music had on people. Following his death, film director Jaime Chávarrí made a movie of his life which later received several nominations for the prestigious Goya Awards. Today flamenco is still a huge part of understanding the culture; don't think that Enrique Iglesias is what Spanish music is all about. To really enjoy Spain and flamenco I would encourage listening to the various types of flamenco - preferably Camarón, Paco de Lucia, and Tomatito. When you arrive in Spain make sure you see a show. ¡Vive España!